"Free Your Mind And Achieve Peace! Discover How To Live In Peace And Harmony In A World Full Of Uncertainty And Dramatically Improve Your Quality Of Life Today!" 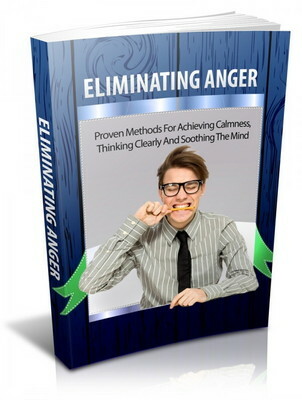 This is an informative eBook which shall surely enlighten you in regards to ways of effectively curbing anger for an efficient lifestyle. The reader will get to know some of the probable situations that are more likely to trigger anger outbursts so as to avoid them. Various thoroughly researched inspiration quotes which are associated to standards of positive impetus books mainly in the field of anger management through mental control have been considered in the course of this script. Also discussed are diverse principles and factors that are related to discovering the prime power which lies concealed within you once anger is kept under control. It is a fact that when you learn to control anger then communication issues and your ability to relate well with significant others will improve. As a result, you will have a healthy mental & psychological mindset for improved social functioning. Researchers have managed to prove that adequate meditation and leading a healthy lifestyle all play a major role in ensuring that one doesnt get stressed to the point of becoming angry. Uncontrolled anger outbursts will make one do very silly things that would later be regretted. For instance, some people have burned up their spouses due to very trivial issues. Only to later discover that this action disfigured them and would also necessitate lots of money in terms of hospital bills to cater for injuries sustained. Reading this script would aid one in knowing simple steps of controlling anger even in provoking situations. The author has keenly delved into the extensive topic of attaining calmness through appropriate mind control techniques. Eliminating Anger is a step-by-step guide book that focuses on helping one to realize simple treasures of life that are hidden from those who regularly experience bouts of anger. These may for instance include inability of one to identify a potential wife and appropriately court for an established relationship leading to marriage. You will also get to know ways in which one can effectively eliminate anger using appropriate humor. This therapeutic technique against irritation does work for several ordinary cases in a persons life, plus it does help quite a lot. Instead of getting nervous in regards to another individuals actions or behavioral trends one can decide to make amusement of the condition or words they are speaking. To relieve off stress that leads to tantrums one need to have the capacity to make fun out of negative instances. The person has to give appropriate explanations in regards to whatever has happened instead of laying blame on others and getting angry. One can only get rid of anger using wit if he/she isnt a phobic towards terror and the situation isnt very grave. Your key purpose in anger management must always be in regards to avoiding any scuffle or fight even when another person offends you.